The BBC carries the stories of more and more protests and attacks on Western Embassies across the Middle East and North America. The situation is debated across the airwaves. What is particularly depressing to me is the frequency with which it it assumed that all Middle Eastern Mulsims have a particular view of America, or conversely that all Americans and westerners have a particular view of Islam and the Middle East. This post goes against the trend. 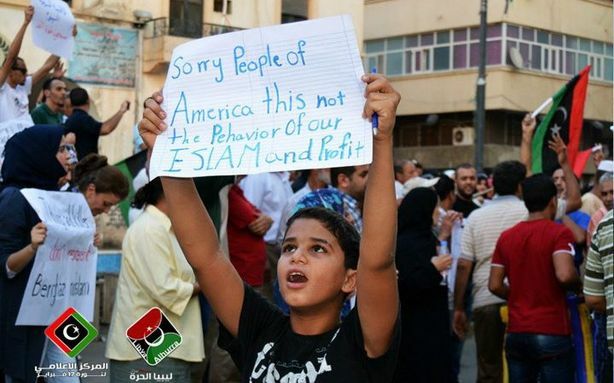 It shows photos of Libyan Muslims demonstrating against the violence done to western embassies and in particular expresses sorrow and regret over the death of the American Ambassador to Libya Christopher Stevens. I find it moving and hope that it demonstrates that all might not be as simple (and as grim) as it first appears.